5.80 points at 10 votes (rank 675). 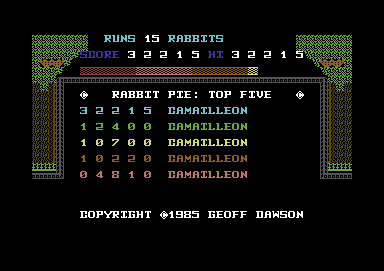 Rabbit Pie is a Collect'em Up by Illusion Software, Ltd. from 1985. 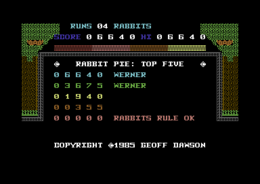 The player steers a rabbit named Roy through two different, alternating game sections. 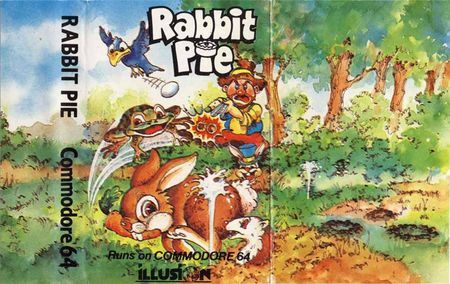 In the first screen you need to collect top hats, which have the offspring inside peeping out, through a labyrinth of hedges, while Jones the farmer tries to shoot the grown-up with his shotgun. In the second screen the task is to eat the field of carrots in a limited time and at the same time avoid an aggressive crow named Bernie, who bombs you with exploding eggs. Collecting a bubbling bottle makes sure that there is no ammunition for the crow for a short time. Wenn all carrots are collected, you can leave the screen through the entrance and you get a time bonus. Then the game starts again with changed layout of both screens. Of course it is nonsense, that rabbits bring up their offspring in top hats – real wild rabbits live in oversized cowboy hats. Simple graphics with a slight Spectrum flair meets equally unnoticed sound effects and a short title melody. The dithering of the rabbit after getting hit, adds a slightly morbid touch to the game. In the 2-player mode one player takes Roy the rabbit and the second player farmer Jones and the crow Bernie. There is a highscore list, but it is not saved. In the second screen empty the vertical corridors directly after the bird has thrown an egg. The upper rim of the screen is especially dangerous, because the bird is faster than the rabbit. Meanness: if you have collected all carrots and lose a life after that, the whole labyrinth is filled again. You start the game with five lives; you get another life every five completed levels (maximum seven lives). For each carrot you get 5 points. For each cleaned carrot field and leaving it afterwards you get additionally 100 x level number points. After the 7th run the level repeat themselves (and then you know how the cat, er... rabbit jumps...). Rabbittron2084: "A Pac-Man version with a rabbit instead of the yellow grapefruit. A simple but sweet game with strongly notchy controls, which stands out as extremely disturbing in hectic situations and which lowers my otherwise rather positive impression to 5 out of 10 points." H.T.W: "The game is also interesting in the 2-player mode with approximately equipollent opponents, if the players chase the points alternately with Roy the Rabbit and its enemies." Jodigi: "A nice and funny Pac-Man clone." Ingredients for rabbit pie: 1 wild rabbit, 225g smoked bacon, 1 tsp breadcrumb, thyme, marjoram, sage, laurel, nutmeg, salt, pepper, 2 eggs, 2 tsp cognac, parsley, laurel leaves, juniper berries. You might enjoy a rosé or a light red wine. In the highscore table hides a small side blow towards Jeff Minter from Llamasoft: "Rabbits rule o.k. - Llamas no chance"
Only scores reached with the 1 player mode are allowed! This page was last modified on 7 April 2019, at 23:08.